What if everything we know about motivation is wrong? It’s not the corner office, the parking place with your name on it, a high salary or the perks that motivate. 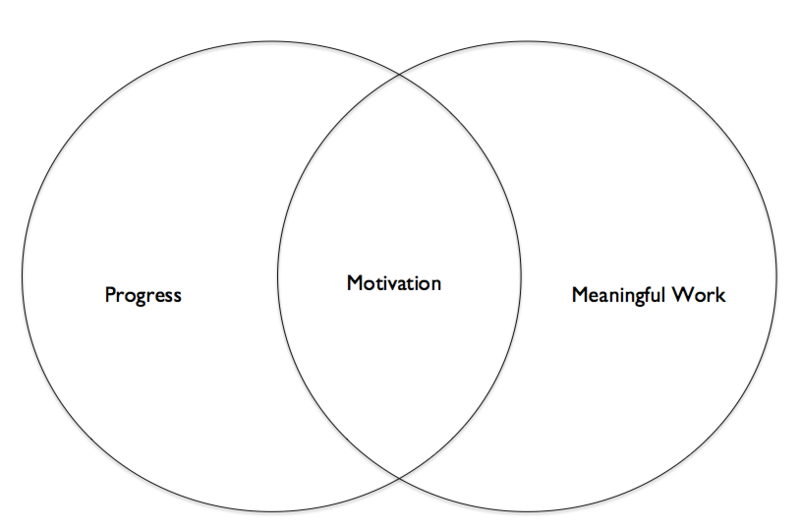 Motivation is making progress on what has meaning for you. When we are fixated on the big win, it’s hard to see that there might be another way forward. And when the big win is out of our control, it’s tempting to stop and wait for help. But not making progress saps our motivation. Finding one small thing to do isn’t about the shouldering the whole burden for a project or changing the company. It’s about keeping your motivation strong. There is no need to take on the world. Instead, make it tiny. Ugh. There was no way to speed up the CEO hiring process. Her progress was blocked and her motivation was low. We played with ideas until we came up with this: “Our partners lack a convincing business case for our new marketing approach.” While not beautiful prose, it does suggest an action my client can take: Rather than wait for the new CEO to be hired and hand down a business case for the tactics she’s itching to implement, she can look for ways to make that case herself. Tiny ways. Eensy, teensy ways. Ways that keep her motivated and moving forward, no matter what the CEO does or doesn’t do. I don’t know what meaningful work is, but I know what matters to me. When I focus on what I care about most, I’m tireless. When I lose that focus, I droop, then sputter to a halt. Isn’t it lucky that where I place my attention is the one thing I can always control? I care most about excellence. It still feels like a privilege coach a person or a team that is already brilliant, and help them get better, or start something new. I will turn myself inside out to help them. I inconvenience myself. I take risks and grow for them. I commit to their success. Situations where I am asked to remediate a person or situation, bore me to the point of madness. Most are easy to spot: The protestations of deep, deep commitment are not backed up with adequate funding, staffing, infrastructure or planning. How do you nurture your motivation?